The UK economy is “turning a corner”, Chancellor George Osborne has said in a speech in London. Mr Osborne cited “tentative signs of a balanced, broad based and sustainable recovery”, but stressed it was still the “early stages” and “plenty of risks” remained. Mr Osborne said that recent months – which have seen more upbeat reports on the economy – had “decisively ended” questions about his economic policy. A tiny uptick after a huge and long depression is barely anything to celebrate. It is a probabilistic certainty that after falling off a cliff and lying prone on the ground awhile, things will one day sooner or later tick upward. Five years later is much later than sooner, and we’re not even back to the level of activity that existed in 2008. It could be eight or ten years at current growth levels after the initial events of 2008 that we make it back to that level of activity. And there is no sign that unemployment will begin coming down any time soon. In the long run, the sea will once again be calm and flat but no-one knows how long away the long run will be. You cannot cut your way to growth. 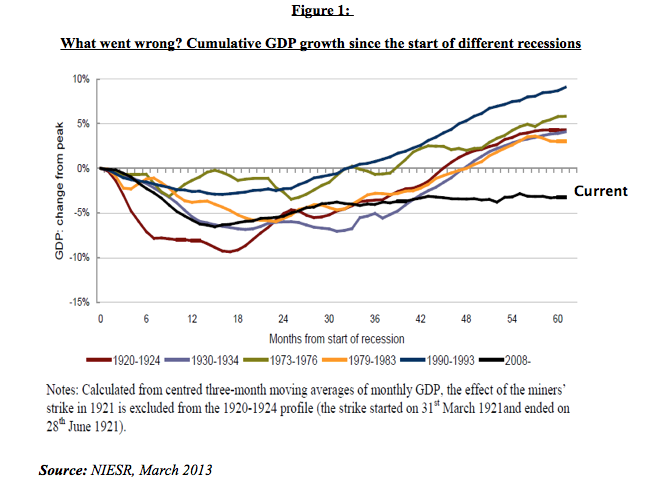 You do not stimulate growth by taking money and economic activity out of the economy. That is the manner in which you instigate depression. Supplies of capital and labour are both extremely slack — this is illustrated by the extremely low level of interest rates, and the high level of unemployment. Eventually the excesses of capital and labour will be used up, and the economy will return to full-employment and growth. But eventually could be a very long time. Waiting around when capital is available at the lowest interest rates in history and while unemployment continues to number in the millions is extremely dangerous and fragilising. Maybe the uptick will continue, and we will return to 2008 levels of activity by 2016 or 2018. Yet we would still have had a lost decade, one that probably could have been avoided had we not embarked on austerity in the wrong place at the wrong time. And it is possible that things may get worse, not better. If I had been the politician who presided over this disaster, I would have resigned and hid myself away behind a rock. And it’s not just Osborne’s failure. The British media and other political parties have mostly failed to hold Osborne’s disastrous austerity policies to account. The fact that this depression has been a greater slump than the Great Depression is not the talking point that it ought to be. Perhaps that is because all the major political parties bear some responsibility, as Labour oversaw the start of the slump from 2008 to 2010, and the Liberal Democrats and Conservatives have overseen the continuation of the slump from 2010 to 2013. Whatever the reason, it is dreadful, and individuals from all sections of society continue to suffer for this disastrous mismanagement. This entry was posted in Current Affairs, Economics and tagged bond vigilantes, confidence fairy, david cameron, george osborne. Bookmark the permalink. ← Will Robots Drive Us To Socialism? Osborne is primarily the Tory election strategist. It has been said that the way to tell if a politician is lying is…if his lips are moving. No politician ever admits to his mistakes, but always spins the news to indicate his own brilliance. In the US, they report a reduction in the unemployment numbers while ignoring the fact that fewer people are actually employed. They also tell us real estate is rebounding. True, sales are up, but most are investors scooping up cheap properties they can turn into rentals. Home ownership is at an all-time low. When vultures are feeding on dying carcasses, this is not a sign of a recovery – unless you are a politician. In even basic biology classes, students learn many examples of growth in closed biological systems. A common example is algae in a pond, which goes exponential in the late summer, and then the growth collapses, a victim of it’s own over-exuberence. When yield becomes unsustainable due to too much being asked of the system, growth always collapses. . I see the economy a lot like one of these biological systems. Left unfettered, the private sector would grow like crazy and eventually collapse, just like the algae bloom always does. Government seeks to regulate this effect, but they are also parasites on the host. As government confiscates more and more resources from the private sector (overfishing), yields eventually go down, I think you see that threshold represented by the Laffer curve. Far from members of Congress saying the debt doesn’t matter, it is precisely Congress that has claimed the debt is some sort of problem: i.e. it is Congress that has placed a wholly unnecessary limit on the amount of stimulus in recent years. I think our deficit is far too small. With real interest rates and nominal interest rates at an all-time low, the markets are crying out for more government securities. The side effect may be higher inflation, which is a good thing as it will decrease the real value of the nominal debt load the private sector is burdened beneath and encourage spending. When you say that the government has run out of options, this is nonsense. The government never tried a job guarantee program, or a mass infrastructure building program. All that has been tried is monetary stimulus, which has failed, and fiscal austerity which has also failed. That scares the %#! @ out of me. Politicians are actors, and are backed to do the bidding of the Elite’s wishes. How else would they be elected without the assistance of a complicit media. Follow the money, who owns the Media. I had no Major MSM support of my policies on my campaign trail, only a couple of low circulation local papers, that not many people read. I used Facebook and Twitter, but with 40% of my electorate above the age of 60, how could I deliver my message? There will be a cleansing war before anybody who can overturn the interests of the Elite, has any influence. Aziz, if you want a solution to UK’s problem, may I suggest the following. An Estate Tax to recirculate capital in the economy. This would be filtered back into the economy by reducing taxes on business investment, such as 100% deductibility for machinery (Non vehicle as a conduit for personal tax fraud), so 100% budget neutral. Diversion of Military budget into road construction. Local Government repairs of pothole due to the road being built poorly in the first place, chews up a lot of resources., Build it right the first time. Diversion from overseas military hardware purchases back into British made machines. Use your best tourist earning Pound asset; The Royal family, more effectively by getting them to do more public service engagements where wealthy people from overseas can buy “Elocution lessons”. Nothing more “Queen’s English” than that. Encourage a Visa for :Inventor scheme” where Patentable Patents give residency and associated tax advantage. Return Britain to the status it had 150 years ago as a Island of Inventors. Follow the advice of the London Mayor and leave the EU but go back to your Commonwealth roots, where people of Commonwealth Nations (Such as Australia) can have reciprocal visa and work rights (See Adam Smith’s Wealth of Nations ideas before US Independence. You’re right. The only point I would add is that Osborne (like Rogoff, Reinhart, the IMF, OECD,etc) has no understanding of national debts, deficits, etc. So his mistake is not just HIS MISTAKE: we’re talking about a form of mass delusion, or mass ignorance. More details on this, as you doubltess know, have been spelled out ad nausiam by Bill Mitchell on his blog: “Billyblog”. Or as Dean Baker put it, “In elite Washington circles, ignorance is a credential”. But the crap emanating from Osborne’s mouth has been calculated to press the right emotional buttons with the electorate. It will fool 99% of the population, including much of the political left, who are as thick as Osborne. If I can judge how the MSM reported on my election campaign, everything the MSM writes is rubbish. No wonder we scratch our heads. it is not meant to make sense! Nice post. You make a great point in the last paragraph. The response from the media has been very poor. Osborne’s triumphalism yesterday should have been destroyed in the media, especially by the left. But the most stinging rebuttal he received was from Fraser Nelson of all people! 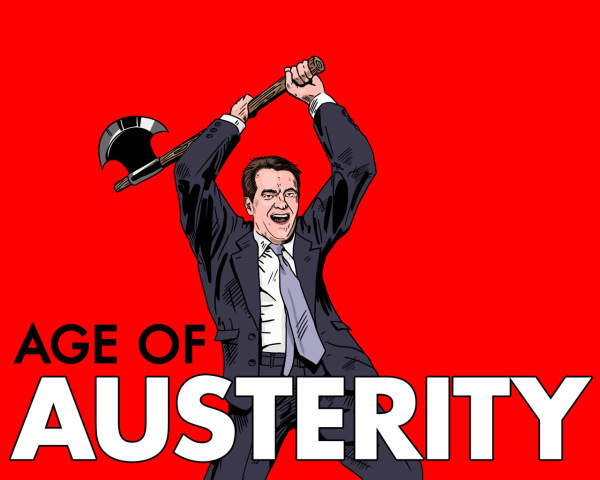 The left needs to get more vocal, or Osborne’s myth making will soon become perceived wisdom. Martin Edwards – “I see the economy a lot like one of these biological systems.” So do I, and good on you for making the connection. I always think that if something doesn’t work in nature, it won’t work here either. Unfortunately, the addicts want another hit. They’ve forgotten what happened the last time, or maybe they just want more of “something for nothing”. Ah, yes, it’s easier to STEAL from those who saved. When you print more money, past money is then diluted and worth less. Instead of the profligate and something-for-nothing types going bankrupt (which used to be the way things were done), they’ve come up with a new plan – just inflate away their problems, and screw anyone who stands in their entitled way. I find these people very dangerous as it seems to me they don’t do what’s right, but only what serves their entitled minds. You can see this same mind set at work as they justify the stripping of the planet. I just wanted to make a general comment to the group concerning a comment made to me during the previous subject posted. Essentially, I was told that this commenter would no longer be interested in chatting with me. I am not sure how long we have been doing this together, but one of the really nice things about this group is that although we are all VERY different, each person has been quite open and very respectful of the others point of view, understanding that it is our differences that make this blog so interesting. I do understand that I am more ‘out there’ then most, and I often try to challenge people’s preconceived notions of [whatever], but I believe this gentleman made a mistake in suggesting that I [or anybody else] would not be welcome in any of the conversations. Personally, I have learned from everybody who has posted here, and although I might come across as if I believe, ‘I get it,’ I will be the first to tell you that not only do I not get it, but nobody gets it. Otherwise, there would be no reason to have any of these discussions. What makes this so much fun is that knowledge is constantly changing, like everything else, so I would hope that we can keep a decorum of friendliness and openness to everybody who chooses to be a part of this community. 2) SICK? WHO GIVES ATOS? A sick person died after being told to get a job as his heart condition wasn’t “life-threatening”. 3) ATOS MACHT FREI – ATOS ORIGIN TEAM UP WITH GAS CHAMBER FIRM! Atos Origin, the poverty pimps currently pocketing hundreds of millions harassing people who are claiming sickness or disability benefits have teamed up with manufacturers of the holocaust’s gas chambers Siemens. Siemens will contribute its Siemens IT Solutions & Services for €850-million to Atos Origin and become a shareholder of Atos Origin with a 15% stake. Siemens are most famous for their use of slave labour during the holocaust. Prisoners were utilised by Siemens to build the gas chambers in which they would eventually be murdered…………..
6) THIS GOVERNMENT (Aided by ATOS) KILLS! ” A Freedom of Information document from the DWP has revealed that rather than an average of 32 deaths per week as a result of Welfare Reform that figure has now risen to an average of 73 deaths per week! When is this going to stop?! When are people going to wake up and help us fight against this government?! We need help! How many more vulnerable, sick and disabled people have to die before something is done?! Very informative post. The pictures are fine. The comments are also great. Thank you for good writing.